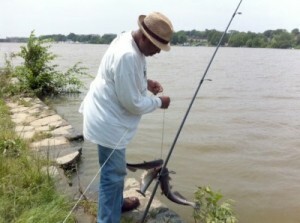 Bobby Jones spends most of his days reeling in river catfish from the Anacostia River. Exactly how many people are fishing in the Anacostia River’s polluted water is not yet known, but Anacostia Watershed Society advocacy director Brent Bolin tells us that he’s seen a large increase in the number of fishermen since the recession began. WAMU’s Jessica Gould reports that starting in June, the National Oceanic and Atmospheric Administration will be sponsoring a survey to find out who is fishing in the river and why. Many of the fishermen Bolin sees have coolers used to store caught fish, which leads him to believe they are likely taking them home for food. But Anacostia Riverkeeper Dottie Yunger, who advocates for clean water, says eating catfish can be dangerous. She says studies show many of the brown bullheaded catfish in the Anacostia have contaminants in their tissues and cancerous lesions on their bodies. Despite the danger in eating the river’s fish, Bolin says fishing is quite common off of the Maryland and District shores of the Anacostia River. AWS conservation biologist Jorge Bogantes is helping to oversee the NOAA survey. He says they will also be looking into the racial and ethnic makeup of the fishers, their socioeconomic circumstances, how often they are fishing and why they are fishing. Bogantes believes that fishing in the Anacostia is a recreational activity for some people, but not for everyone.